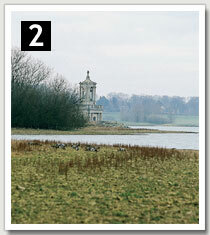 YOU arrive on the banks of 3000-acre Rutland Water for the first time. But where the hell do you start? What flies should you put on? Which spots fish best in a South-westerly? Can you wade? To help newcomers to the “big puddle” enjoy their day at our finest fishery, we’ve put together our own guide to bank fishing, listing the 24 best areas around the reservoir. So don’t be overawed by Rutland’s size. Just treat every area like a small fishery on its own and you’ll be on your way to a full bag of silver fish. April: Black midges appear from opening day so heavy, slimline Epoxy Buzzers like the Blakeston’s with its orange cheeks, or the Spanflex with its pearly thorax, work from the start when fished in sheltered water, often under a “bung.” In deeper water, try a coral or orange Booby or marabou Damsel. May: A greater variety of midges now start to hatch including the red and green varieties. So vary the colours of your Buzzer patterns. The classic Gold-Ribbed Hare’s Ear will now start to work as the first of the lake olives come off. June: Trout will now be rising to hatching insects, so dry flies like the red CDC Emerger and Suspender Buzzer will take fish. July: This can be a tough time to fish from the bank, but a dry sedge fished at dusk should bring results. Otherwise stick to a Pheasant Tail Nymph or red-headed Diawl Bach. August: Feeding on “jelly fry” around the weedbeds now starts in earnest and the fish can become increasingly hard to tempt. Try a Silver Invicta or a Hare’s Ear. September: The fish will now start to move inshore from deeper water and although the weed may be heavy, they can be tempted by a variety of nymphs like the Pheasant Tail, Fraser Nymph or Corixa. October: Water temperature is now dropping and the trout now switching from insects to fry. White lures like the Cat’s Whisker or the Floating Fry come into their own. November: By now the weed has died away and serious lure fishing takes place. All you need is a black and green Tadpole or a Minkie, easily the most successful fly at the back-end. December: Water levels will have dropped and the water becomes gin clear over a weedfree bottom. Lures will work on the isolated shoals, or even tiny dry Black Midges for a lunchtime hatch. BANK fishing at Rutland is all about understanding the wind and treating it as your friend, rather than your enemy. Ideally, you want a gentle breeze blowing from left to right if you are a right-handed caster. This way you can let your flies drift along naturally with the wind. The other option is to find a bank where the wind is blowing onto the shore. Provided it is coming in at a bit of an angle, you will still be able to cast to trout that have run down the wind, or are moving up the bank to face the drift current. The easiest bank to fish will be the one where the wind is behind you. These protected banks can be productive early season when the fish are shoaled up in calm water, but soon become empty of fish once they start to feed naturally and have to search around for food. Cold Northerly winds are most common early season, but they do allow easy fishing from the deeper north shore. But when a fierce Northwesterly gale rakes the water, the few areas still fishable soon fill up with anglers. This is one of the worst winds on the water and can colour up great areas. Favourite wind with anglers is a warm moist South-westerly, provided it is not too strong. It encourages insects to hatch and blows them along the surface of the water. A stiff Southerly allows anglers to fish the North Arm bank from the Peninsula. A hot dry South-easterly in summer will get the fish moving into deeper water. It’s then that the dam wall comes into its own. Easterlies are never a favourite wind with anglers anywhere as they can be cool, even in summer. TWO concrete breakwaters built to shelter the boat fleet offer easy fishing and casting for beginners. But space is limited on the walls and you may need to get there early. Depending on the wind direction and strength, you can either fish the deep water off the walls, or turn round and fish the shallower harbour where many specimen trout move into during Autumn and Winter after the coarse fish fry. THE shallow bay between the lodge and the church can get busy with tourists on Summer weekends. So it’s best fished at the beginning and end of the season, particularly Winter. The bank on the other side of the Normanton Park hotel has two deeper areas that can be reached by bank anglers when water levels are low. Further along, deeper water runs closer to the high water mark between the two small planta¬tions. Again, a great spot for a resident fish. THIS famous spot used to be three trees but one has now been felled. A good cast from the bank here will hit deeper water. The shallow point further along the bank at Mowmires Reach is favourite with anglers searching the deeper water on the drop off to the left of the point. Also look out for the blue aeration pipes which leave the lake. This is another deeper spot that always holds trout, often resident fish. The bottom here is gravel and attracts brownies in autumn. HARDER to fish from than some dam walls due to its rocky boulder construction. You’ll need a line tray to prevent line damage. The Fantasy Island corner is the hotspot with no boats allowed within 100 yards. Food will accumulate in this corner after a North-westerly blow and attract trout. The Sykes Lane corner is the other hotspot. Overall, the dam wall fishes best early and late in the season - look out for fry-feeding brownies - but will hold fish all year. High back casts are essential to prevent fly damage. Wadeable? Don’t even think about it! Wind effect: Tricky in a NW. Best in an SE. A due East back wind may cause leader tangle. THIS popular bank mark holds fish all year, and after a recent stocking it can be hard to find bank space. Great buzzer water due to the shallow nymphs beds. But go to your right and you will find deeper water off the Monument. Search the weed beds on a Summer evening for resident rainbows. They will take a dry fly or nymph. In Autumn, Floating Fry patterns and Cat’s Whiskers will work when fished around the weed. Brown trout often shoal up here in the corner by the dam after the fry. DEEP water close to the shore here will hold fish in most weathers, hence the name. The bottom is rocky and there is no need to wade as the fish will feed close to the shore. The prevailing South-westerly wind blows into the Bay and, if the water remains clear, will produce good sport for anglers who can put up with casting into the wind. Wind effect: Best on SW or NE. ONE of the most famous and popular bank spots on Rutland, especially at the start and end of the season. The shallow water at the top of the Creek always holds fish from opening day. And if a strong South-westerly is blowing straight into the creek when the fish are stocked, they will run straight up to the end of the creek. If the wind allows it, try the East bank nearer to the creek mouth. The point with the fence is a hot spot. Whitwell has produced some of Rutland’s biggest fish down the years as they leave the deeper water and move into the margins. Sailing activity makes Whitwell a difficult place to fish in Summer. A NOTED reservoir hotspot as it offers easy access to deep water. A shallower point on the right-hand side attracts fish and a good cast will let the angler fish the shelves either side. A Westerly wind lets the angler fish his flies from right to left. Naturally, space is limited here and sail-boarders often launch from the shallower area. It also can colour up in a strong wind. When it’s clear, fish can be seen cruising the shallow bar. Noted for its brown trout at the end of the season. Wind effect: Light westerly or South-westerly best. But is exposed to strong winds. WHEN a big wind gets up on Rutland, the boats head for Barnsdale Creek. This protected piece of water holds fish all year, but is particularly good for nymphing in May and June. And you can catch fish on fry patterns here from the end of Summer right until the last day of the season. However, the bank angler can struggle to fish here because of the trees, which stretch right down to the water’s edge. One of the top spots is just inside the Bay in front of the hedge end. Space is limited here but increases as the levels drop. The bank opposite the wood can be good early season after stocking, while at the very end of the season some very big fish run up the creek right into the stream. THE bank from Barnsdale to Dickensons is more the province of the boat angler, and can colour up very badly in a Westerly wind. However, the small bay at the boundary of the wood can produce well at buzzer time. If you drive down Barnsdale Hill past the Country Club, and park at the water’s edge, there is a short length of bank where you can reach deep water. To the left is a shallower bar that invariably holds trout. Into Dickenson’s Bay, there are two hotspots. If the water level drops sufficiently, you can wade out from the point to reach the deeper water, while the small point halfway along the bank (look for the tree stump) marks another deeper spot. The western bank is rather shallow and colours up quickly. IT’S the quality fishing with imitative patterns on these shallows for silver, grown-on rainbows that makes Rutland so special. Heavy weed growth around the margins can make it difficult for bank angling, but some of Rutland’s best fish spend late Spring and Summer browsing the North Arm weed beds. Here you will need to target moving fish in the shallow water, taking care not to scare them. A small CDC dry, Pheasant Tail, Diawl Bach Nymph or Corixa, presented on a long leader is the approach required. Take care you have plenty of backing as a fit four-pounder will quickly empty the reel. The limit of fishing is marked by bird-reserve warden Tim Appleton’s cottage where an old fish-pond wall is exposed by falling water levels. Fish can be found right up to the limit of fishing. Further right, the shallow bank area from the submerged road right round to The Transformer offers exciting fishing before it becomes too weeded up in late Summer. LEAVE the Hambleton road onto the unmade track that runs around the peninsula, and the first anglers’ car park you come to is The Finches, named after the public house that overlooks the reservoir at this point. This is a popular spot, espe¬cially with season-ticket holders, as deep water reaches close inshore, The small bay cannot hold many anglers but trout stocked at The Transformer hole up here, along with resident fish. The next car park along is known as Stumps Point, because of the felled tree stumps revealed at low water. All this bank is worth exploring, fishing the small bays and points, but it can colour up badly with a North-westerly or North-easterly blow. THE Peninsula bank to the boundary of Armley Wood offers all sorts of exciting possibilities, provided it is not being scoured by a North-westerly or North-easterly wind. A number of small troughs, bays and ridges will all hold fish at times in Spring. Anglers car parks are provided at intervals along the peninsula track. When you arrive at the wood, the trees come right down to the water making a backcast impossible. The bottom is also snaggy with many tree stumps. However, go to the right of the wood and you will find deeper water close in. Move along the bank until you find the fish. This is a hotspot for the last two months of the season when the weed has died back and the trout are hard on the fry. A FAVOURITE spot due to the deep water close to shore. The extensive weed beds hold fry and good fish are caught in autumn and winter. But you may need to cast a fair way to reach deeper water. The water here can colour up badly in a strong Northerly or North-westerly, or go very clear with a back wind. Try to fish near the weed beds, which may not be obvious except when you recover a piece of weed on your fly. The actual point of the bay is the most popular spot but fish can be caught all the way along the shore to the wood. A GREAT early-season spot for stockies, which love the deep water close to the bank. With any type of back wind - Northerlies are common early season - the bank angler can reach deep water with a good cast. Spud Bay is the most popular spot. Three double-figure browns were once caught from this mark in a week. With high water, the bank angler doesn’t even need to get his feet wet. The lake bed is quite soft and silty and enjoys good hatches of midges, but many fish are caught here on lures and sinking lines. There are two small bays in front of the wood, fishable only at low water. These can hold fry feeders around the undergrowth. The steep banks from the wood to Yellowstone all hold fish at high water. THIS prolific shore mark is not the easiest place to find, hidden in the trees of Hambleton Wood. Yellowstone has two major points. The one with the no-wading sign is deep with a clay bottom. The other point that leads to the bay with the dead tree is a shallower bay with buzzer beds. This is the best point with deeper water to the left and shallower water to the right and holds fish all year, drawn there by buzzers and fry. Trout stocked at nearby Old Hall will often run into this Bay. ONE of the most obvious features at Rutland, this peninsula with its historic manor house is a magnet for anglers early season. And with good reason. At times rod after rod can be bent from this deep-water mark. The prime spots are the corners of the Point with the flies allowed to drift around in the breeze. But fish can be taken anywhere. Close to the car park is a deep hole, not evident at high water. The silty bottom here is rich in bloodworm and this hole surrounded by shallows is a natural holding spot. If you can’t get on the point, try casting into the deeper trough to the west of the point. 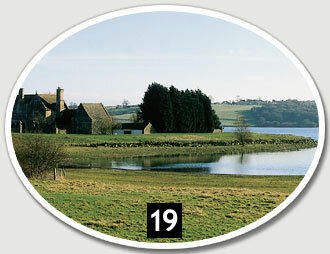 ANOTHER favoured area for the Rutland aficionados, who like the challenge of natu¬rally-feeding fish. This shallow water area at the top of the South Arm switches on in May and June when the buzzers start to hatch, but it needs the water level to be high. Parking is easy, but you need to be here early in the morning to enjoy the best sport. The bank fishing limit here is the fence. Halfway back towards the Point, you’ll find The Stones, a small point where you can reach deeper water. GIBBET Gorse marks the limit of bank fishing. This is an exposed stretch of bank and can colour up badly in a Westerly wind. There is more shelter to be found at Berrybutts Spinney, but you need the water down to be able to fish in front of the trees. The next bay along is more popular with weed beds holding fish. The trout will shoal here early season when the wind is blowing into the bank, but you will need suit¬able gear to get the distance. Wind effect: Nice to fish with a gentle left to right west¬erly. But will colour badly on a North-westerly. ANOTHER favoured bank spot where anglers can reach deep water close in. The best areas are west of the Point. Stock fish will shoal up here from opening day, and you may have to be up early in the morning to gain a place. A Booby is a good fly to use here as it will ride over the boulder-strewn bottom. The small plantation of trees at the end of the point restricts access at high water but fish are nearly always to be found where the shelf drops to deeper water. More marks can be found from the Point back to Sailing Club Bay, but this back can be very exposed to the wind and quickly colours up in a north-westerly wind. There is also limited access to deeper water. THIS mark is either full of fish, or devoid of them, depending whether stocking has taken place. When a north-westerly gale is ripping up the reservoir, the west shore of the Bay is one of the few places that provides some shelter. A great place to hunt fry feeders in autumn as they move along the margins and weed beds. Can become too low to fish from the bank when levels drop. Has provided some of Rutland’s biggest fish. ALTHOUGH one of the closest stretches of bank to the lodge, it’s also arguably the most productive throughout the year. Many bank matches are won here and it also regularly produces some of Rutland’s heav¬iest trout thanks to the vast shoals of coarse-fish fry attracted by the yacht moor¬ings. The point is the key spot with its two drop-offs into 12 feet of water, but Pontoon Bay can fish well at high water.